Barnyard gift boxes - Easter Barnyard Boxes farm images! Barnyard gift boxes to make and fill with gifts or treats. These little gift boxes look gorgeous as place settings a tea party or filled with treats or favors. Each box is 6.5cm wide x 5cm deep x 8cm tall. The templates come in four different colour ways, are simple to put together and come with full & comprehensive instructions. 2. You are now ready to print and assemble your gift boxes! They can be printed on letter or A4 paper and include full and easy instructions for assembly. Be sure to check some of our other craft templates such as our reindeer template, Holiday angel pattern and lucky cat cutout garland. Barnyard gift boxes for your gifts or treats! Perfect for wrapping gifts or fun party favors. Over 30 gorgeous printable gift boxes ideas! 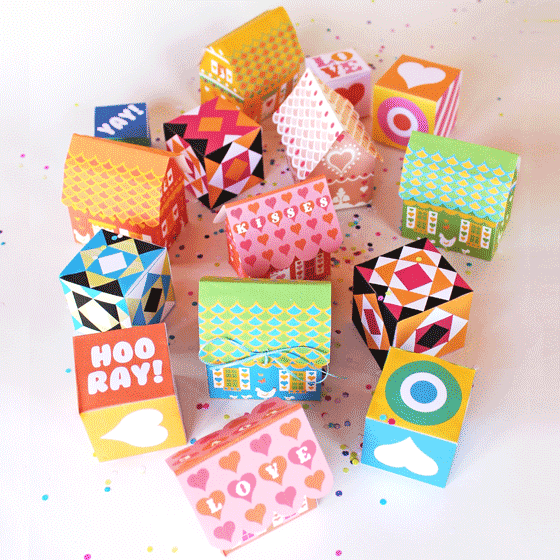 The printable gift box sets include: Barnyard boxes, Cookie cottages, Geometric cubes, Gingerbread house boxes, Happy cubes, St Valentine’s cottages and Love cube gift box templates. We hope you like our Barnyard gift boxes! If so, please give us a little love by liking us on facebook, pinning us on pinterest or following us on twitter. Thank you!